The “good” witch after two hours of trick or treating last year. Happy Halloween everyone! 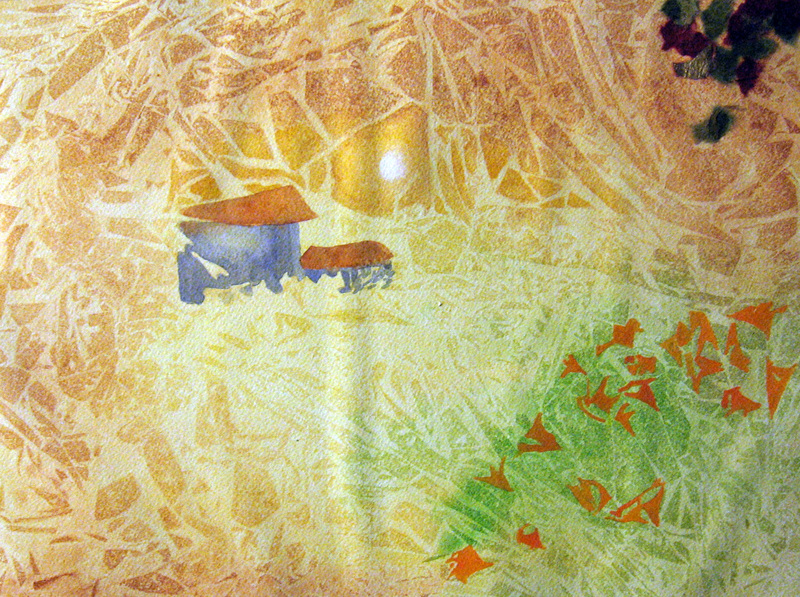 This week in watercolor plus class we all did a saran wrap print in watercolor. The above is my print plus my beginning stage of figuring out how I was going to use it. We turned our prints around looking at it from all 4 sides until we saw something we could work with to create a picture or an abstract to enhance. I always like to use the forms of the original print and try to build on them. 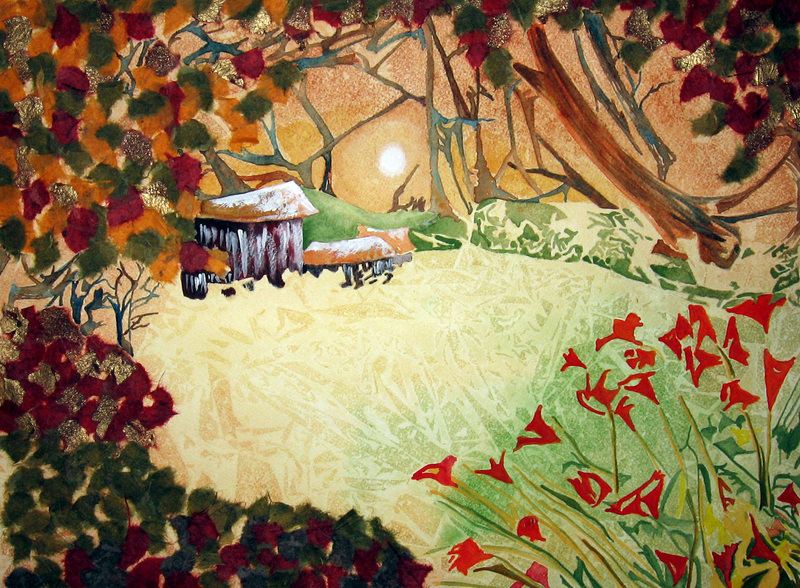 I began by building on the moon, outbuildings and foreground flower shapes I found. The moon was filled in with gesso as white didn’t quite eliminate the color from underneath due to the transparent effect of watercolor. The shapes of the flowers and outbuildings were there, I just painted them in. I wanted this to appear as though I was peering through foliage, from a distance and began laying out different colored leaf forms I tore from rice papers. 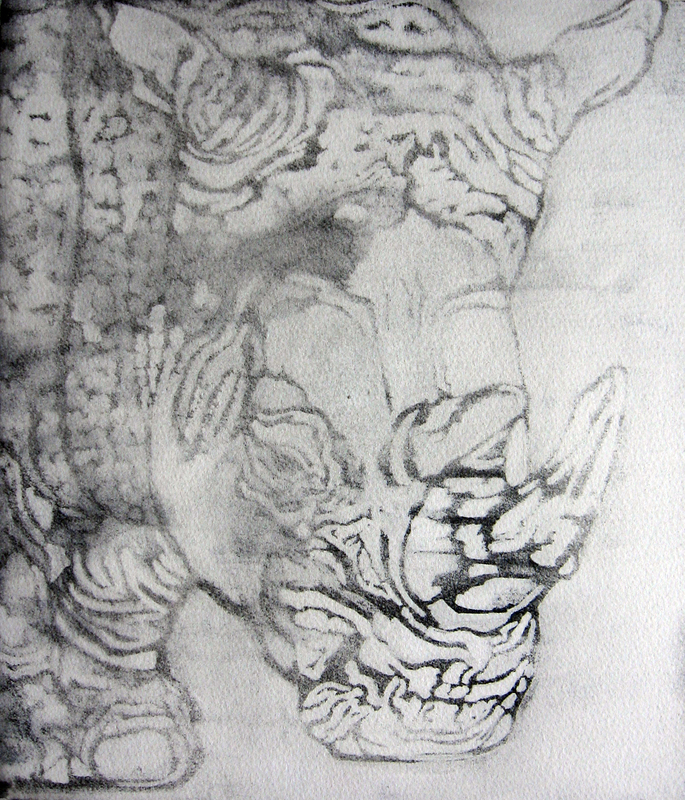 I used acrylic matte medium to adhere the leaf forms to the paper. In the next step, I finished the leaf forms, detailed the foreground flowers and changed their color from orange to red as I thought the red brought them into the foreground better. I finished the outbuildings and had to use some gesso in them because they began to disappear. I began selecting tree shapes from the print and painting them in as well as the greenish hill forms that ran across the paper. Note that I painted the shapes that were in the print and did not add my own. This is what gives this a stenciled cut out appearance. In the third step, I filled in the tree shapes, brightened the moon and furthur accentuated the foreground flowers and leaf shapes. In the final stage, I balanced the white in the moon with adding white rice paper flowers to the bushes that looked like a dark blobs in the foreground. 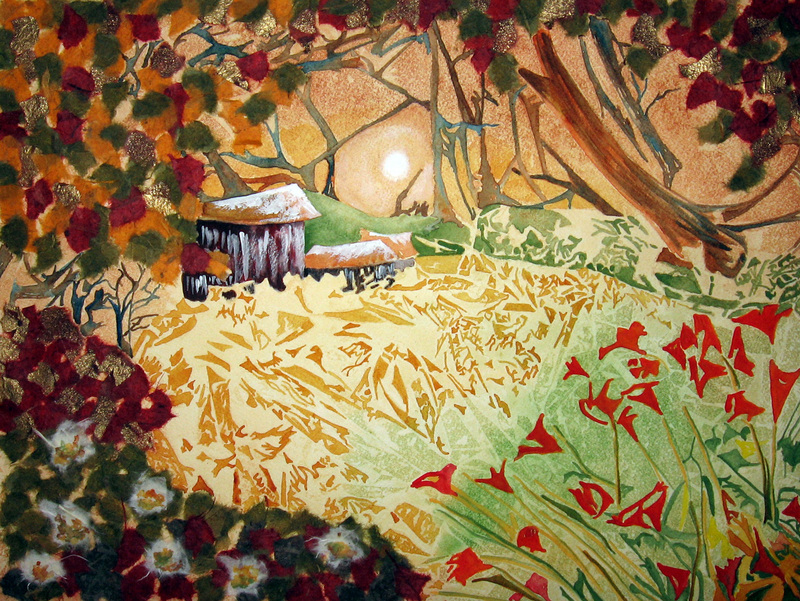 I also painted in all the little printed shapes in the open meadow area in front of the outbuildings. This exercise is fun but very time consuming and really tugs at your ability to be creative. Joshua Sellers has posted this painting along with a Haiku by Issa. I am becoming more and more interested in Haiku by following this blog. 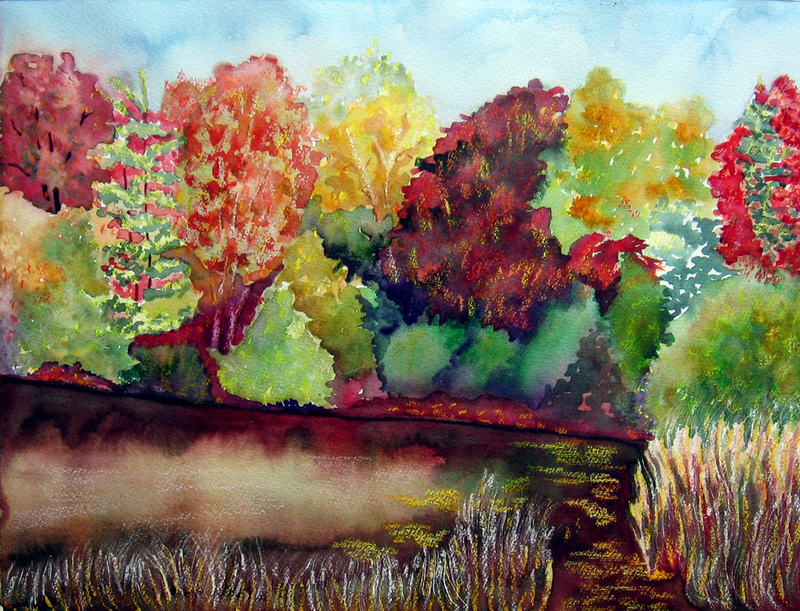 Beth Parker has tried this same technique using fluid acrylic paints here. This week in Creative Drawing we practiced drawing by using only cross contours. We drew our subject material by imagining that our pencil was travelling across the form from top to bottom and left to right. As the pencil moved across the form we tried to replicate that form. We lightened the pressure on our pencil where we saw more light or where the form moved towards us and applied more pressure where it was darker or moved back and away. 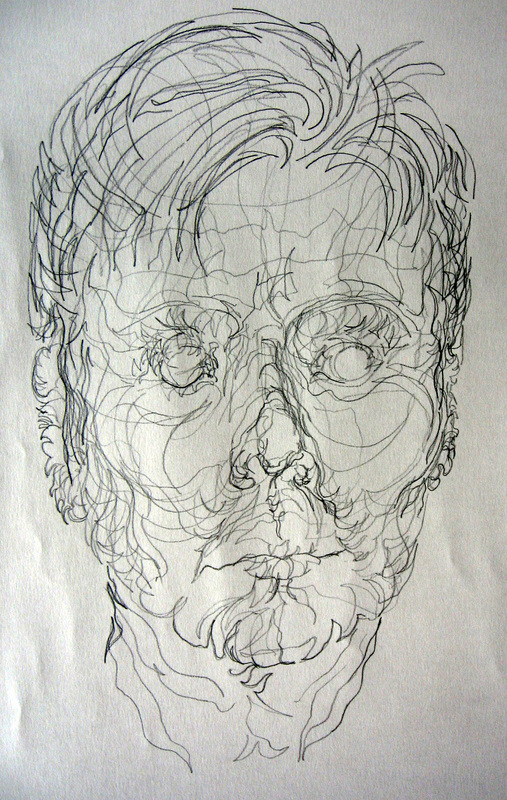 We concluded that cross contours could add to the shape, heft and movement of a drawing. We decided to look for the evidence of cross contours in finished drawings and paintings that we observed in the future. 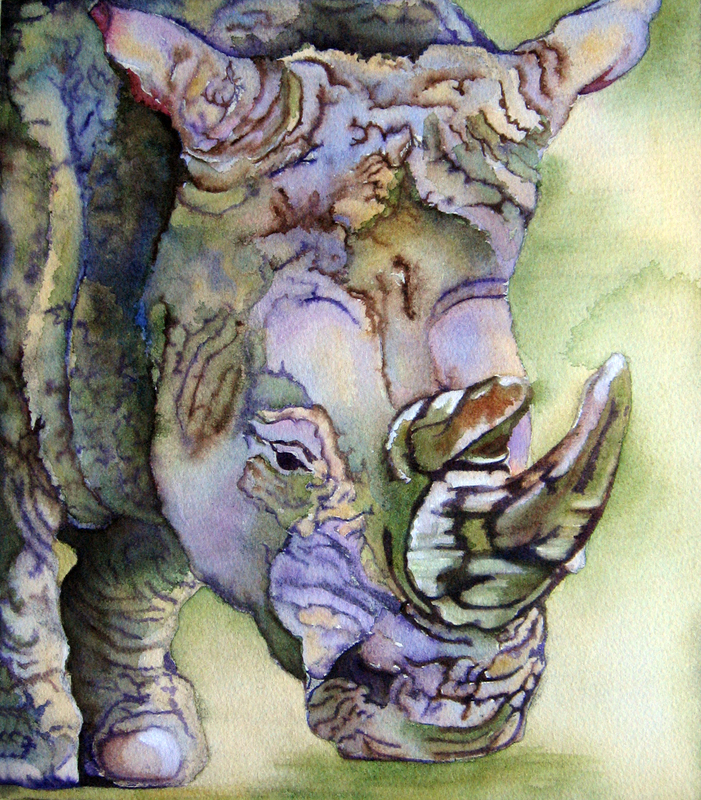 I decided to title this piece “Grandmummy” because my grand daughter recognized it right off as being me. I guess that’s a good thing? This painting was started on one of the last warm days we had last fall. 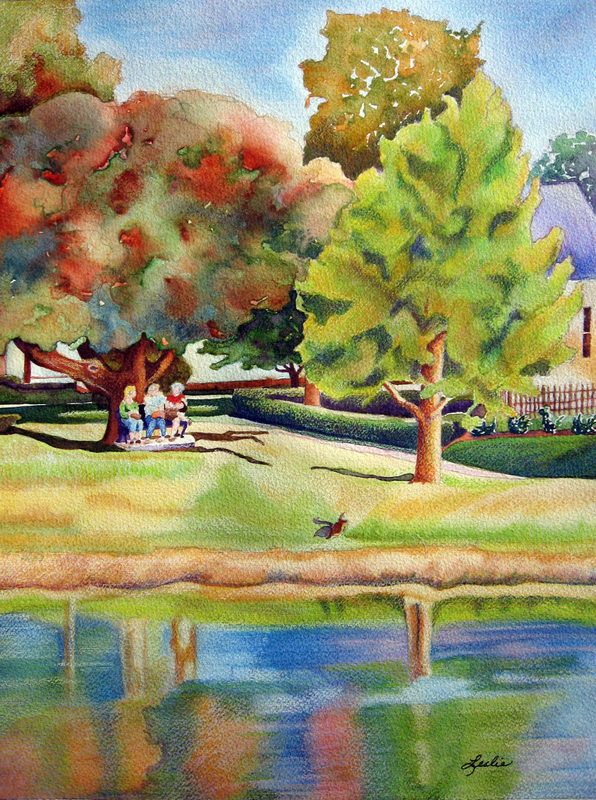 I sat on the near side of the pond at Lakeside park and began painting the big orange and green tree on the other side. The geese and ducks were walking around me because I had scattered bits of bread and crackers for them. As I was laying my initial washes in, three ladies walked past, stopped to take a look at what I’d done, continued on around the bend and sat down on the bench under the tree. One of the female ducks, eyeing them, waddled down to the pond, swam across and waddled out on the far shore. I snapped a photo as she shook her feathers. Little did anyone know they would become part of this painting. About a week after painting this, I began a colored pencil class. The teacher had stated that colored pencil works nicely to brighten up a watercolor. I pulled this painting out and gave it a try. This was the end result. I think our last warm day was earlier this week. A chilly wind is blowing, rain pouring down and the leaves are falling all around the neighborhood today. The weather forecast calls for more of the same. 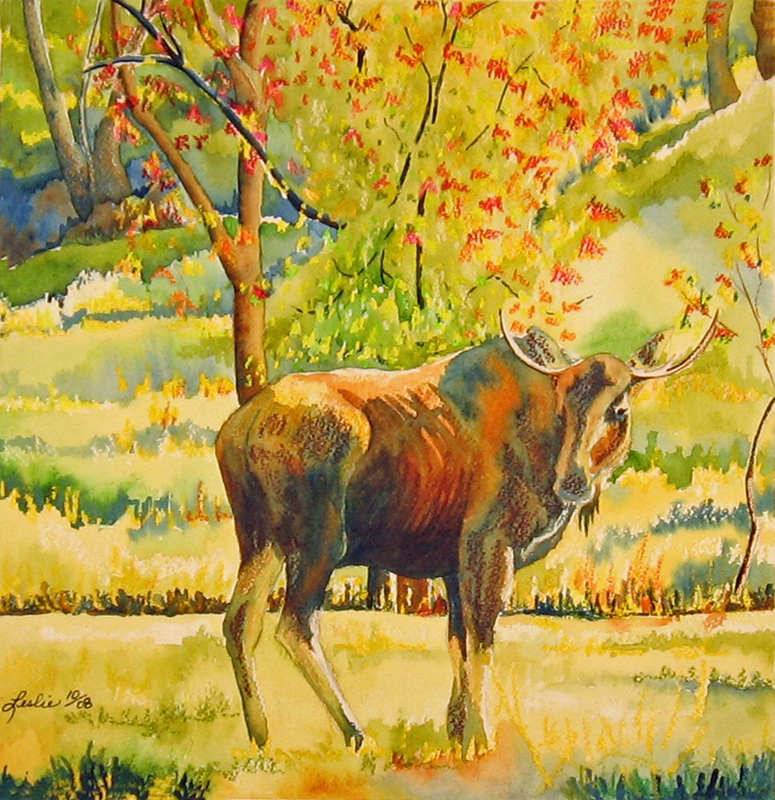 Beth Parker has tried this technique with colored pencil on a watercolor. I was so excited about the exercise from creative drawing class that I wanted to try a distorted grid with watercolor. I first marked off my photo reference in a grid with all spaces of the same dimension. 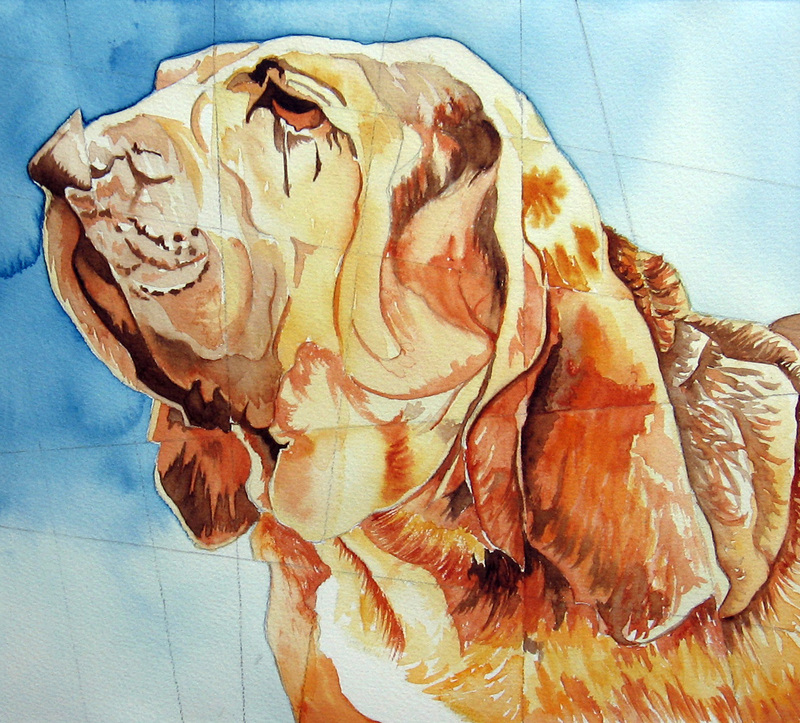 Thank-you to wet canvas.com for the photo reference of a bloodhound. Next I marked off a piece of cold pressed 140lb Arches with the same number of lines vertically and horizontally as I used while creating the original grid. In this step I angled lines every which way to distort the size of the spaces. Be careful to not cross vertical lines with other vertical lines or the horizontal lines with the other horizontal lines. I then drew the image, one space at a time, onto the distorted grid following the spaces from the photo grid. This led me to have to make decisions as to how I was going to fill that distorted space with all the information in its’ corresponding space in the photo. It led to a distortion of the image in the photo as you transposed it to your new grid. I had furthur distorted the image by changing my format from a vertical one to a slightly lengthened square. In the above picture you can see the divisions of space that I had to work with. I decided not to connect the line from the nose or the one in the ear and several that didn’t match up to their corresponding lines in the next space over. I like what it added to my image. 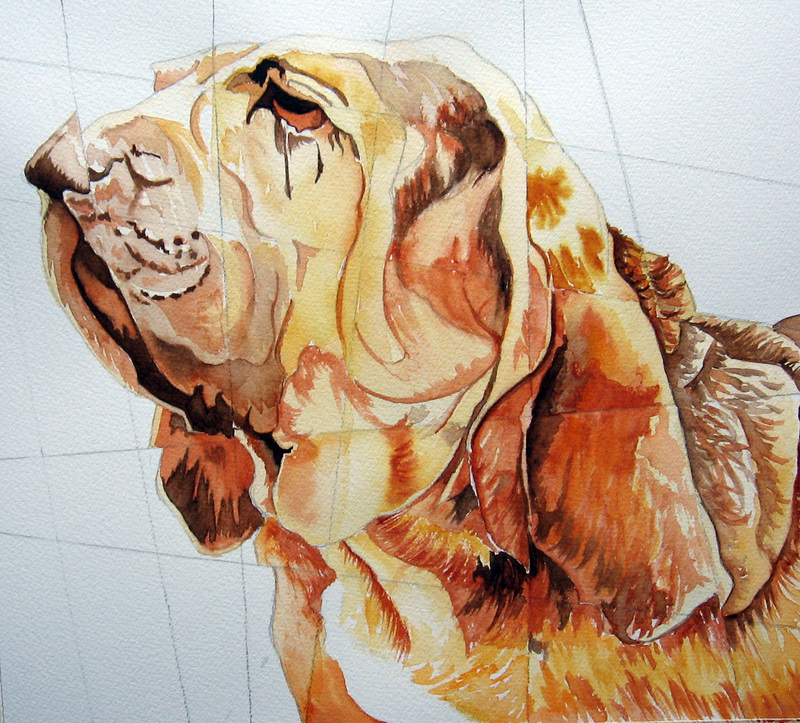 I also liked the fullness of body this format and grid gave my bloodhound. At this point, I could have erased the grid lines and finished the background but instead chose to leave them in so the finished piece would show the whole process of creating this image. The above is my finished painting using a distorted grid. Last Sunday I awakened from a very brief dream. I rarely dream and almost never in color. The scene I witnessed was so beautiful and surreal that I felt at peace and as though I’d been given a gift. I saw two pure white sailboats traveling left to right on blue-violet waters with waves splashing against their sides but not slowing their steady progress. Behind them was a bright orange and yellow sky with the sun setting behind the trailers of clouds slowly moving into the distance. My immediate thought was that I needed to paint the scene. Never, ever have I painted strictly from my head. I used to draw and paint pictures, as a child, that way. I was amazed to find that I was able to duplicate the colors and the shapes I had witnessed. This has made this simple painting experience very special for me. Because I am a curious person I have a dream book and looked up the items of my dream. The best I can decipher is that the sailboats represent smooth sailing and because they are white, they also represent purity. The blue violet water represents truth and wisdom. The yellow -orange represent self control, thoughtfulness and consideration. The sunsetting through clouds represent peace after an emotional storm. Simply my dream message may have been that emotional upheaval may be averted if I use self control and am considerate and thoughtful of others. These simple truths will provide me with wisdom and smooth sailing. The fact that there were two sailboats means these things doubled. 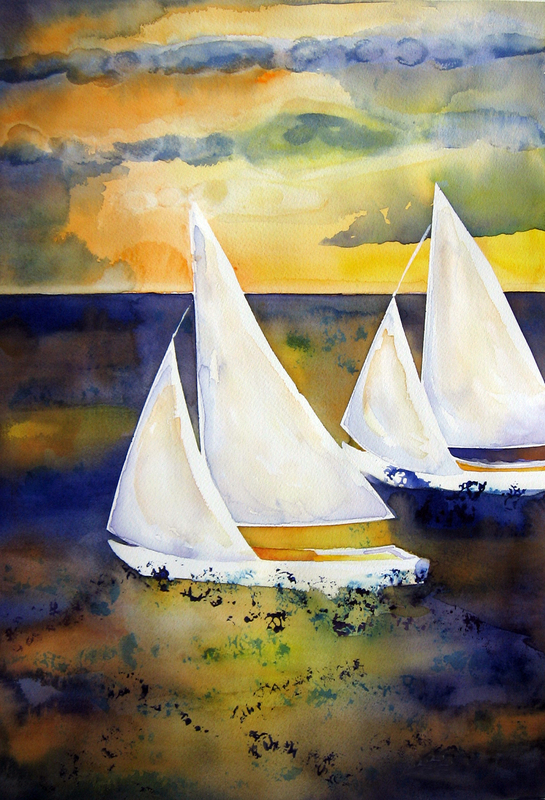 I used frisket paper to mask off the sails and applied the large washes of sky and water. While the sky was still wet I dribbled alcohol through it to make the two strips for the trailing clouds. While that was still wet I fed light washes into it of violet and antwerp blue and the clouds appeared where the alcohol was drying. The bits of texture for waves were created by printing a darker mixture of the blue and purple with paper doily cuttings. I painted the white of the boats with white acrylic gesso and used light washes of winsor orange and blue-violet to tint the sails. While the sail washes were wet I floated washes of permanent white gouache into them to brighten the white. I used a rigger and white gouache to draw the lines from jibs to masts. This is a time when the experience of painting was more enjoyable than the satisfaction of the finished work. Almost forgot the dream book I have (it’s very simple really) is The Mystical Magical Marvelous World of Dreams by Wilda B. Tanner. This week in watercolor plus class we worked with wax resist. We actually used regular crayons for our paintings. One thing I have to concentrate on is getting enough crayon or wax on the paper to resist the color. Crayon color with the same value of watercolor used, doesn’t create much of an effect. What I like about this technique is the textured look it gives the painting. It also helps me to be a little more loose than I would normally be with the same scene. I also used a technique called sgrafitto ( simply means “to scratch” ). I lost the wax resist in the foreground grasses so used a scratching tool and a razor blade and scratched them back into the paper. If your intent is to scratch back to the white of the paper, beware not to paint over the scratch marks as the pigment will settle into the grooves and make the scratches darker. We also talked about using ink for some of the tiny branches in a scene like this. I used ink for the little branches on the red tree at the left. I should add that I always spray wax resist and watercolor with a light layer of matte fixative for storage purposes due to the wax. I haven’t had any problems with this. This is a new technique called gouache resist that I just tried and had never heard of before. I found it by visiting Raji’s Art Pearls blog. Please visit her site and read about this technique as she has taken the time to link to a wet canvas site that explains this technique step-by-step. She has also included a link to the artist web site who paints this way and has many of her finished paintings posted. My print is not as dark as I would have liked but I was still able to use it to paint from. The ink offered incredible patterns to enhance the finished result. 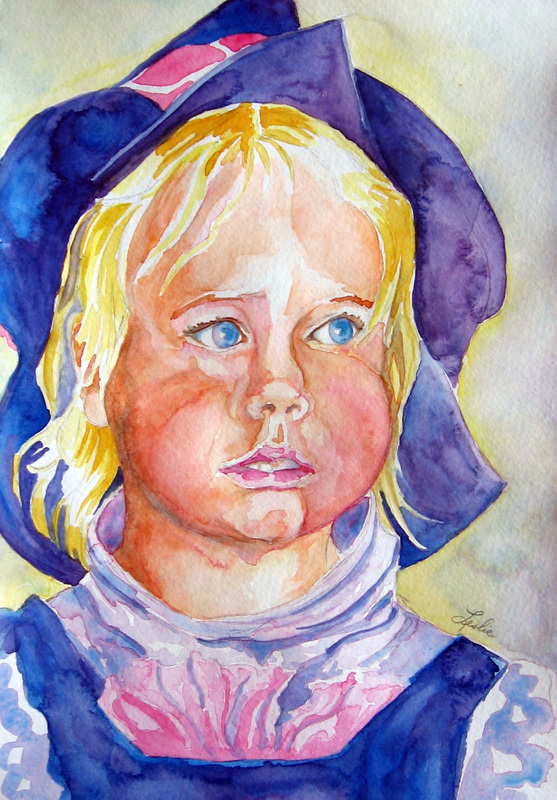 I will be teaching this technique as part of my Watercolor Plus class. I think it is an incredible exercise for making decisions about value, color and line. 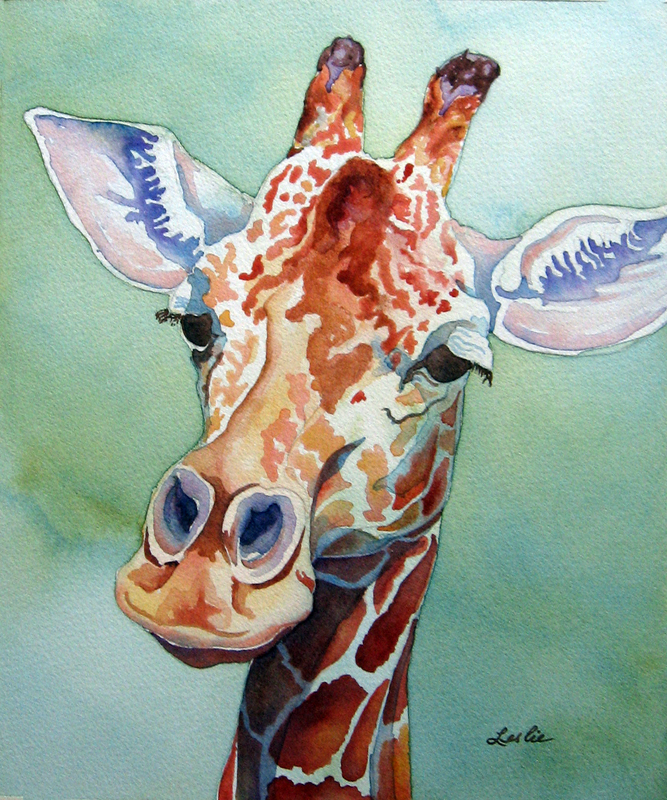 Our childrens’ zoo offers the children an opportunity to feed the giraffes. Because of that, I am able to get wonderful photo references for painting. I painted this on 300lb Saunders Waterford cold pressed paper.